Andy beams from a stall full of tubers on a market day. Lynch Creek Farm's booth at the Olympia Farmers Market is still chock-full of fat, healthy dahlia tubers just waiting to go into the ground. The warehouse at the Farm is still replete with tubers to grow beautiful dahlias in a wide range of colors and types. But the clock is running. Planting time is looming for the gang at the farm, and tubers of some varieties are running low. For the best selection, now is the time to make your choices and order your dahlia tubers online or, if you're in Western Washington, to stop by the public market at the north end of Capital Way in downtown Olympia. The Olympia Farmers Market is a fragrant, colorful array of wonderful, fresh produce: fresh greens and salad mixes, the season's first Washington asparagus, root vegetables and fruit delight the senses. Dairy products include farm-fresh milk and artisan cheeses; baked goods include bread, savories and sweets. Fresh, pastured meats, smoked meats, shellfish and seafood are all available. Adding savor are an array of locally-made sauces and salsas. at the farmers' market in Olympia. Cut flowers lend color to the scene (fabulous tulips are in right now). If you garden, you'll find — in addition to Lynch Creek's great dahlia tubers — bedding plants, vegetable starts, perennials, and shrubs and fruit trees. Creative vendors offer soaps and lotions, jewelry, wooden items and arts and crafts of all sorts. Live music and international foods, with a covered area for enjoying them, add to the ambience. It's the kind of friendly space where conversations spring up among folks waiting to be served at the various booths. 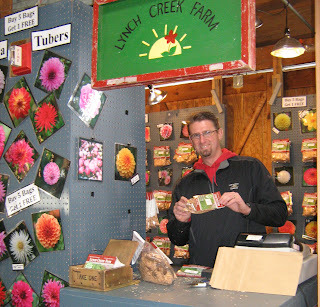 And speaking of conversations, you'll find more than fine dahlia tubers in the Lynch Creek Farm stall. Ryan, Evé and Nathanael can offer advice about choosing and growing dahlias so your tubers will thrive in your garden. Buying online? Send the farm your questions. Andy and the staff are happy to help their customers grow the loveliest dahlias possible. But get on with it! It's time to plant! Don't Waste those Weeds - Eat Them!